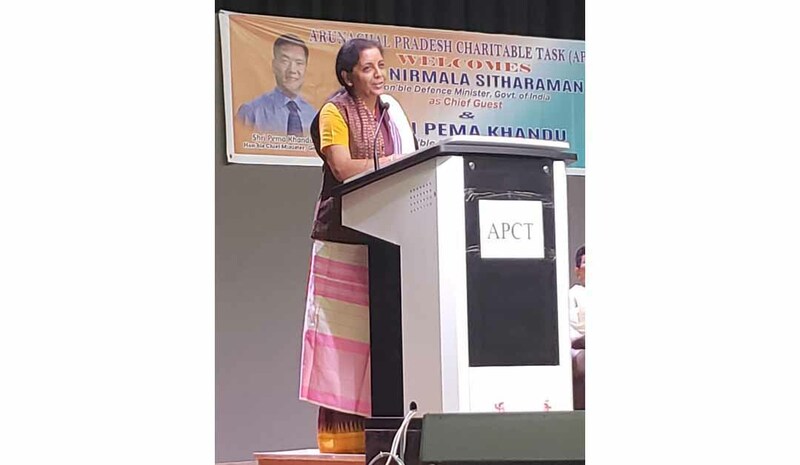 Defence Minister Nirmala Sitharaman in her lecture at the the seventh Rutum Kamgo Memorial Lecture in Itanagar on Sunday spoke about the importance of language and regional dialects of the country. She also spoke about the importance of forging alliance between India and China to establish a new world order. The Rutum Kamgo Memorial Lecture has been organized by Arunachal Pradesh Charitable Task (APCT) at Dorjee Khandu State Convention Centre. The Rutum Kamgo Memorial Lecture commemorates the contribution of late social activist Rutum Kamgo towards socio-economic development of state. Kamgo was a social leader who spent more than two decades championing the need to retain and nurture traditional culture till his demise on November 5, 2011 in a road incident. APCT chairman Katung Waghe said that the 21st century belongs to Asians as 20th century belonged to the Americans and 19th century was of the Europeans in terms of power and development. “Sitharaman will be exploring the ways and means to strengthen Sino-India ties that the two ancient civilizations can together emerge as the pivots to the new world on the day,” Waghe said.